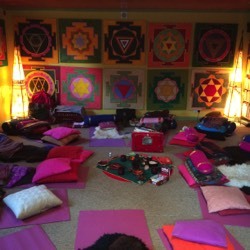 Women’s Yoga is a way of practising yoga that honours our ever-changing moods, cycles and rhythms. Bringing to the mat who we are today, right now, and moving, exploring from a place of awareness of that knowledge of what is present for us today. 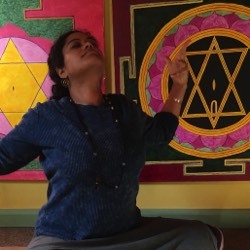 In our circle we will experience gentle juicy yoga asana (stretches) and mudra (hand gestures) that honours our divine Shakti, as well as immerse in Total Yoga Nidra - profound relaxation in a lying down meditation that is the fertile soil for the flowers of our inner wisdom to blossom. All women welcome. 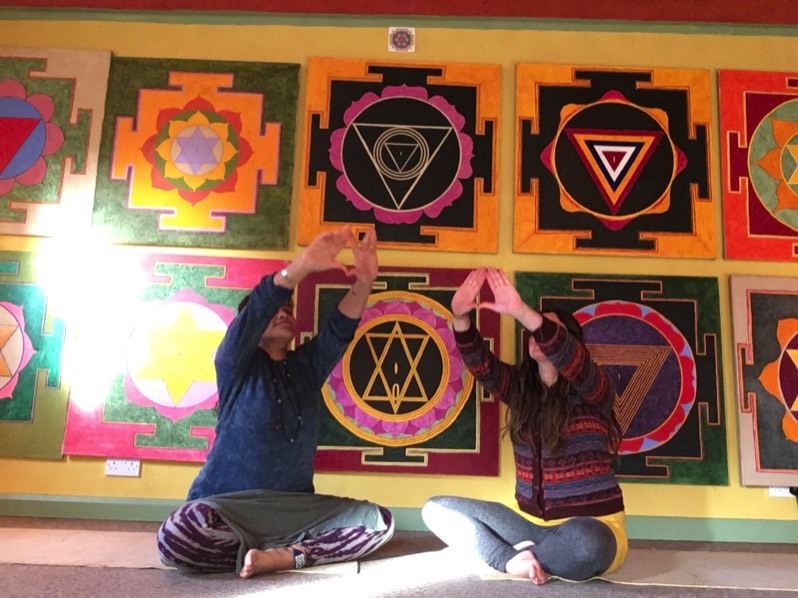 Danielle and Sivani Mata are honoured to be offering this regular circle in the home-studio of their teacher, Uma Dinsmore-Tuli. This womb-like space is held by the striking images of the Daśa Mahāvidya Yantras (geometrical forms embodying ten great aspects of what it is to be feminine), painted by Nirlipta Tuli. 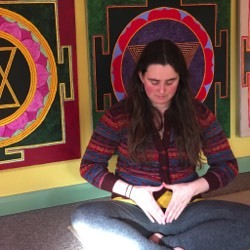 The space has housed many women's circles, womb yoga classes and trainings, as well as yoga nidra trainings and is therefore the perfect setting for our practice together. 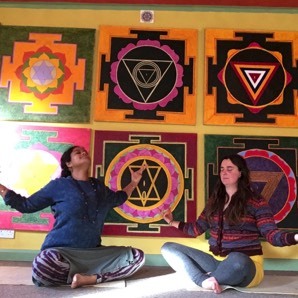 We are grateful for Uma and Nirlipta's support, the use of their space and the teachings they have shared with us. Investment: £16 or £11 concession – Prebook only (details below), space for 13 women at each session. The studio is one mile east from Stroud station. Gunhouse lane is a turn off the A419 London Road that runs from Stroud to Cirencester (on your right coming in from Cirencester and on your left heading out from Stroud). At the bottom of the lane is the Topps Tiles showroom. If you are driving please PARK ON BOWBRIDGE LANE, as Gunhouse Lane is a private road. Walk right up to the very top of the lane. Tanglewood is at the very top, where it carries straight on and turns into a track and behind a gate. Please do not follow the top of Gunhouse lane around to the left - this leads to Thrupp House - this is NOT Tanglewood. PLEASE PLEASE PLEASE DO NOT PARK IN FRONT OF THE BIG HOUSE AT THE TOP ON THE LEFT OF THE LANE, or on the Gunhouse Lane, this annoys the neighbours. There is space for some cars to park at the studio, please contact us in advance if you would like to do this.